1. This paper describes a Proposal for Action for the elaboration of national and regional aquaculture development policies; policies that will enable aquaculture overcome its present difficulties and realise its potential contribution to improved regional food security and economic growth. 2. Aquaculture, in any of its varied forms, can play an important part in rural development in Africa. To do so, aquaculture must be well understood. This understanding should be based on an awareness of past aquaculture development efforts, using the successes and weaknesses of these to guide future ventures. This document is intended to foster such an understanding among decision- and policy-makers of the region. 3. Aquaculture has the potential to play an important role in Africa. Small-scale fishponds can be integrated into traditional farming systems to diversify production, reduce risk and enhance household food security. Larger, commercial-scale systems offer opportunities for income generation as well as a means to offset the imbalances in fish imports experienced by many countries in the Region. 4. However, Africa's aquaculture history has not been full of long-term successes. Although numerous aquaculture development projects were undertaken in most countries of the Region in the 1960s and 70s, there are few sustainable results of these efforts and production remains well below the estimated potential1. 5. A review of past efforts reveals a number of causes for the poor results experienced. Most of the problems can be traced directly to the political/economic difficulties faced by several countries at the time. Other recurrent problems relate to unavailability of production inputs (e.g., feed, seed, etc. ), lack of logistical support to isolated fish farmers and difficulties in competing with cheaper fish products from natural waters. The most serious problem was often the absence of national and regional aquaculture development policies, or the existence of outdated or un-implemented policies. 6. Africa is on the threshold of significant aquaculture production at the beginning of the new millennium. Rural communities are increasingly looking to fish farming to provide them with products that are no longer available from conventional suppliers. Aquaculture can be effectively integrated into a variety of farming systems, developing synergy and enhancing resource utilisation. But, to benefit from this currently untapped potential, aquaculture development must be undertaken within a framework of comprehensive national and regional policies that foster integration and ensure that stakeholders receive necessary support from downsized government agencies. 7. Early advocates often perceived aquaculture as a panacea for African farmers. Beginning in the 1950's and continuing into the early 1980's, aquaculture was introduced into most African countries as an innovation which would provide much needed food and income for rural families who did not have access to fish from major fisheries. 8. Although a number of production systems were tried, including cages, raceways and tanks, ponds remained the most frequent way of raising fish. Most endeavours targeted smallholder farmers and proposed extensive or semi-intensive production techniques, growing any of a variety of native cichlids (tilapias). 9. In many cases aquaculture development strategies included the adoption of fish farming for its income-earning potential. The sale of the fish crop was expected to contribute significantly to overall household cash income. Some projects took this expectation a step further and supported the construction of bigger multiple pond production units where farmers would be able to have monthly revenue from their ponds. In certain cases, fish from a few large-scale farms augmented output from these medium-size farms. These commercial fish farms were expected to impact on individual income through employment opportunities as opposed to the sale of family-raised fish. The fish produced from large farms would also contribute to increased national production, perhaps leading to import substitution. 10. Unfortunately, these developmental efforts met with limited success. A number of international and regional fora were held to assess why success was so restricted and short-lived. In general, the principal constraints to fish culture development were repeatedly identified as; lack of feed, lack of seed (fingerlings) and lack of extension support. 11. To address these issues, aquaculture projects adopted a practice of building government stations that would supply the needed seed while serving as a hub for extension. Extensionists were then trained and equipped to deliver aquaculture messages including techniques deemed appropriate for local fish farmers. These techniques were elaborated at national aquaculture research facilities that also conducted trials on different feeding regimens. Some projects subsequently subsidised identified feed rations to make them accessible to farmers. 12. When these attempts met with minimal long-term success, some practitioners believed that the fundamental problem was one of using unsuitable culture species (or inbred stock). Researchers, often assisted with donor funds, began evaluating alternative fishes. Although some of these organisms did demonstrate improved performance, national aquaculture programmes remained weak and fish farming rarely became a traditional farming enterprise. As a result, Africa today remains the region of the world with the lowest aquaculture production. 13. At the end of the 20th Century African aquaculture has come to a standstill in several countries. Hatcheries and other fish stations are quasi-abandoned while aquaculture extension is paralysed due to limited financial means and/or neglect. Those farmers still raising fish are often doing so solely on their own initiative with little or no public sector support. 14. The lack of sustainable aquaculture in the African Region is, however, not attributable to inherent difficulties in raising aquatic organisms. Often top-down administrations and burdensome government infrastructure that relied heavily on external funding for their existence hindered the long-term establishment of aquaculture. Natural calamities, political upheavals and macro-economic disorder frequently hampered the aquaculture activities that did succeed in developing a solid foundation. 15. At the end of the millennium we are now learning from past mistakes (Box 1) and aquaculture in Africa is once again receiving well deserved attention as an agricultural enterprise which can contribute significantly to the enhanced well being of producers and consumers. As aquaculture is viewed with renewed interest, it is incumbent on all stakeholders to draw lessons from the past and adopt realistic expectations of what aquaculture can and cannot do. inadequate formation of producer groups. 16. These lessons have taught us that aquaculture must now be viewed in a holistic fashion as part of a larger agricultural scheme. Integrating aquaculture and water management into farming systems allows for improved resource use, nutrient recycling and diversification. 17. When these lessons are translated into national policies and development plans, a positive role for aquaculture can be foreseen as an important contributor to the various activities that encompass smallholder farming systems as well as a viable commercial undertaking. Consequently, aquaculture becomes an integral part of broad-based rural development schemes, a sustainable component of family food production initiatives, a means of income generation either through the sale of produce or direct employment, and a tool for achieving household and national food security. 18. The Africa Region offers many advantages for aquaculture production, including good climate, available land and water, relatively cheap labour, and a high demand for fish. It is estimated that 23% of Africa's 2,963,568,000 ha is very suitable for fish farming (CIFA Technical Paper 32). This suitability is to a large extent due to the under utilisation of aquatic resources. Of the Region's waters, it is calculated that less than 4% is used annually (World Resource Institute, 1996). Figure 1. 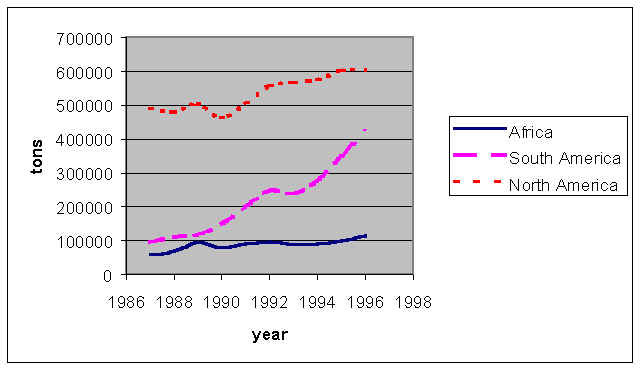 Total aquaculture production in metric tons for Africa, South America and North America for the period 1987 to 1996 (FAO Aquaculture Production Statistics, 1998). 19. However, in spite of these advantages, aquaculture production in Africa remains very low as shown in Figure 1, with production only exceeding 100,000 tons in 1995 and 1996. Close analysis of Figure 1 reveals that North America has had relatively constant aquaculture production, varying from 460,000 tons in 1990 to a high level in 1996 of slightly over 600,000 tons. Production from South America has also been rapidly increasing from 90,000 tons in 1987 to over 420,000 tons in 1996; an increase of nearly five fold. On the other hand, Africa has constantly recorded low production and the resource base has barely been exploited. 20. Future expansion of aquaculture in Africa should therefore involve exploiting available resources and benefiting from areas of comparative advantage to significantly increase aquaculture production. These increases can be achieved through the adoption of enabling aquaculture policies and development plans that optimise output from all segments of the aquaculture sub-sector. 21. As one looks to the future with optimism, it is critical to keep past experiences in mind and recall what can go wrong. Aquaculture is more than simply putting fish in water. Proper site selection is essential. In addition to land, a fish farmer needs a reliable source of good quality water and a culture organism that satisfactorily utilises available nutrient inputs. Furthermore, the fish must also be sold for profit, which requires easy access to markets. 22. Increases in aquaculture production must be accompanied by a corresponding shift in the public sector's role in aquaculture development, a role that continues to be excessively onerous in many countries across the Region. Few African countries have dependable supplies of low-cost animal feeds. Inputs of seed and feed must be supplied by the private sector if aquaculture production is to increase. Governments must dis-invest inefficient infrastructure and concentrate limited financial resources on extension support to farmers, since it is not technology per se that is lacking but farmers' access to existing information. Table 1. Comparison of rural populations and fish supply and consumption for the three regions compared. 1. Source: FAOSTAT database 1999. 2. Source: World Resources 1998-99, Oceans and Fisheries Data Tables. 23. Accelerated aquaculture development will have a positive impact on many aspects of daily life. From Table 1 it can be noted that fish makes the highest contribution to daily animal protein intake for the three regions compared. Nonetheless, fish supply in Africa is the lowest of the three regions. Although average annual marine and freshwater catches for the period 1993 to 1995 increased by 31% and 19%, respectively, when compared to mean catches for the period 1983 to 1985, per capita supply of fish and seafood actually declined by nearly 14% between the two periods. Africa is faced with finite fisheries resources, a growing population and a high demand for fish products, a demand that can no longer be met by capture fisheries and must be augmented by aquaculture production. 24. Table 1 also shows that Africa has a very large rural population, although urban migration is an increasing phenomena. This has two implications. First, rural areas will ultimately be less well supplied with fish from major retailers as urban centres continue to grow and attract more produce with their greater purchasing power. Thus agrarian areas can be best supplied by rural fish farms, which are often widely distributed across the hinterland. Secondly, the large rural population offers a ready pool from which to draw future fish farmers. Since the requisite human resources are readily available for increasing aquaculture production, national policies of many countries in the region should focus on increasing opportunities in rural areas to help stem the tide of urban migration. 25. Water will become the key limiting factor for much of the world in the Twenty-first Century. This resource will become all the more critical in water-stressed areas of the Region where no waste can be tolerated. Aquaculture can be efficiently integrated into irrigation schemes, thus allowing for multiple use of limited aquatic resources. 26. Aquaculture can also improve food security. Farmers often view fishponds and reservoirs as food "banks" which can be relied upon during the "hungry" season. Unlike other forms of animal husbandry, aquaculture provides a product that comes in small packages, is easily prepared and divided among family members; a product that can be harvested when needed most. 27. Larger-scale aquaculture, frequently undertaken in rural areas where land and water resources are available, provides employment while producing a valuable crop to supply local markets and replace imports that are a drain on reserves of foreign exchange. 28. However, aquaculture does not develop spontaneously. Producers require extension support, production inputs (including credit) and access to markets. Although the political/economic environment in many countries is improving, today's governments are faced with reduced budgets and shrinking external assistance. Within this setting, national programmes can no longer be all things to all people and short-term plans cannot be reformulated to suit donor priorities. It is now incumbent upon governments to establish policies that reflect national priorities and stakeholders' needs; policies that concentrate scarce internal and external resources on clearly defined objectives. 29. An aquaculture policy framework is essential to allocate resources (human, financial and natural), focus effort and establish realistic objectives. Such a framework will create an enabling environment that encourages aquaculture growth and development. 30. Policy implementation cannot be separated from manpower development. Effective programmes require trained individuals. FAO has assisted with capacity building across the Region through the African Regional Aquaculture Centre (ARAC) for the period 1980-1986. Subsequently, training has been assumed by national centres (e.g., the Centre National de Formation Zootechnique et V�t�rinaire in Foumban, Cameroon) and regional institutions (e.g., Ecole de Sp�cialisation en Pisciculture et P�che Continentales in Bouak�, C�te d'Ivoire). This trend must be reinforced and attention paid to establishing regional information networks and institutions that can effectively address critical national training and research needs on an intra-regional basis. 31. Concerned about regional issues and the mediocre state of African aquaculture, the FAO Regional Office for Africa organised the Africa Regional Aquaculture Review in September 1999, which assembled practitioners from fifteen African countries and several regional and international organisations. The Review served as a forum to evaluate the past thirty years of aquaculture development efforts in the Region and to identify those elements that were sustainable and those that were not. The Review facilitated exchanges between specialists and took the first step to establish a regional approach to problem solving. A summary of the Review's conclusions and recommendations is attached ( Annex 1). 32. In addition, recent FAO interventions in Gabon, Kenya and Togo have set precedents for developing national policies in a participatory way. With the involvement of representatives of all stakeholder groups, holistic policies have been developed, which will provide an integrated approach to resource use. 33. Sub-regional co-ordination has also begun with the ALCOM (Aquatic Resource Management for Local Communities) Programme in the SADC Region and assistance has been extended to the ECOWAS sub-region through the 1999 meeting of Directors of Fisheries. 34. Furthermore, improvements in regional information exchange has been initiated as a result of the FAO Integrated Irrigation and Aquaculture Workshop held in September 1999, which, following the recommendations of the 1993 Working Party on Aquaculture of the Committee for Inland Fisheries of Africa (CIFA), prepared a proposal for launching a network linking research institutions in the Region. A second proposal for an Aquatic Farming Systems Information Network for Africa is also under consideration. 35. It has been established that Africa has the natural and human resources that give the Region a high potential for the development of aquaculture in spite of current low production levels. Africa also has the socio-economic and socio-cultural climates that favour fish production and consumption. Aquaculture can, and should therefore, play a substantial role in the Regions development. 36. Aquaculture development is intrinsically linked to rural development. Although there is considerable interest in "peri-urban" fish culture to supply city centres, most fish farms will continue to be located in more rural settings where land and labour prices are lower and there are fewer environmental considerations. 37. Precise national policies are necessary to focus resources on areas of high potential and to guide future aquaculture development. Such policies should not deal with aquaculture as a solitary form of aquatic animal husbandry but as an integrated system- integrated both socio-economically into farmers' culture and agro-ecologically into farmers' biophysical environment. 38. Aquaculture can make a positive impact on Africa. If lessons learned are used to guide future ventures through effective and practical policies, aquaculture can be revived from its present stalled state and significantly improve national and regional food security. 39. Decision- and policy-makers should make the effort to understand the aquaculture history of their respective countries within the context of the needs and productive capacity of the fish farming community. Clear and succinct policies will foster confidence among members of this community, encourage private sector investment and attract donor support. 40. Policies need to address key public sector issues of extension, research and maintenance of government aquaculture infrastructure, as well as dis-investment of those elements that exceed government's means or producers' needs. Policies must provide general guidelines encompassing available production systems without imposing a top-down structure or inhibiting producers' innovative spirit. Policies need to be generic enough to address crosscutting issues and flexible enough to be useful in a variety of settings. 41. Policies need to be inter-disciplinary in nature to reflect the integrated aspects of aquaculture; including the biological, chemical, physical, ecological, social, cultural, economic and financial dimensions of fish farming. Policies should be derived from a participatory approach where local caucuses provide platforms for all players to input into policy formulation, and to share the responsibility for maintaining and updating the policy structure as required. 42. FAO will, at the request of member governments and within the limit of its resources, review national policy documents in order to ensure that attention is paid to regional commonalties while highlighting national specificity. FAO will also, to the extent possible, promote regional co-operation and exchange by participating in relevant regional bodies, facilitating regional networking and interfacing with regional and sub-regional institutions and advocating a solid regional policy base. Moreover, FAO will serve as a clearinghouse to encourage standardisation and/or harmonisation of aquaculture activities across the Region, including the collection and analysis of current and comprehensive aquaculture statistics that correctly indicate the state of aquaculture development, and make it easier to monitor policy implementation. lack of reliable aquaculture statistics. Most countries are focusing on small-scale integrated systems producing tilapia and/or catfish (Clarias or Heterobranchus). As effective extension becomes more difficult, there is a tendency to rely increasingly on farmer groups (fish farmer associations). There is also a growing interest in commercial production and greater involvement of the private sector. The Review concluded that: (a) aquaculture is now known throughout Africa as a result of previous extension efforts and (b) adoption/acceptance, even if on a modest scale, has been noted in most countries. Government stations: stations often serve one or more of five common purposes: fingerling production, foodfish production, demonstration centres for extension activities, training and/or research. The first three purposes should gradually be disengaged from government. During the period of disengagement, training should be provided to private sector units such as fish farmer associations and entrepreneurs, to enable them operate such stations in a sustainable way. Government should maintain its support for training and research. Regional centres of excellence: where a centre has the capacity to combine both research and training, it should carry out both functions because research activities can greatly complement training. An evaluation of existing centres should be undertaken with a view to determining their respective roles in the proposed new setting. Database: it is important to identify an institution, university, etc., at the national level, to serve as a focal point for analysis and custody of statistics in a database. The database will input into the sub-regional database and (in turn) this will in turn, input into a regional database. Information technology hardware and peripherals must be considered as paramount when selecting the national focal point. Information: there is a strong need for the promotion of information exchange throughout the region, in research, development, training and extension. This could best be done through networking. It would also contribute to reinforcing linkages between research and development at both national and regional levels. facilitate the formation of farmers' associations. 1 In 1997 aquaculture production was 119,000 tons compared to 25,647,000 tons for Asia, over 645,000 tons from North America and more than 540,000 tons from South America (FAO Aquaculture Production Statistics, 1988-1997). 2 Cameroun, Central African Republic, C�te d'Ivoire, Nigeria, Mali, Zambia, Kenya, Madagascar, Tanzania and Malawi.